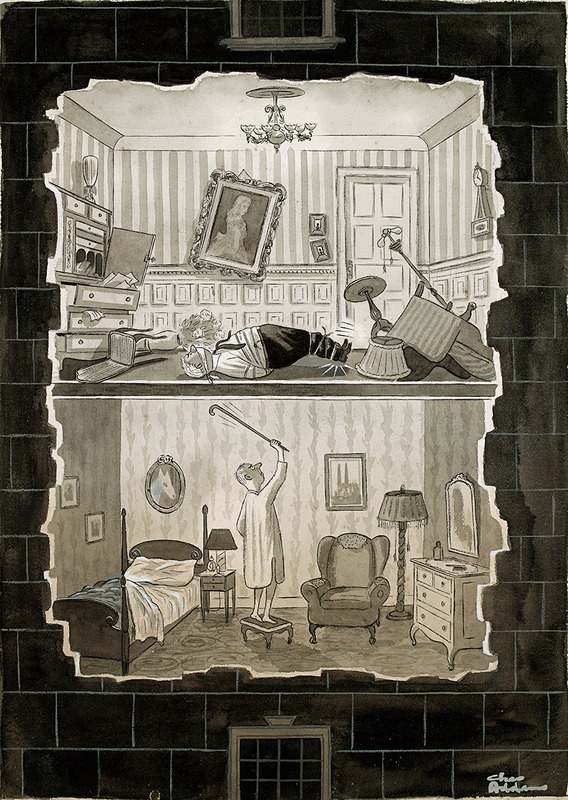 With a proclivity to the grim, grisly and gruesome, Charles Addams (1912-1988) walked through life illuminating its incongruous funny bones and sore spots. 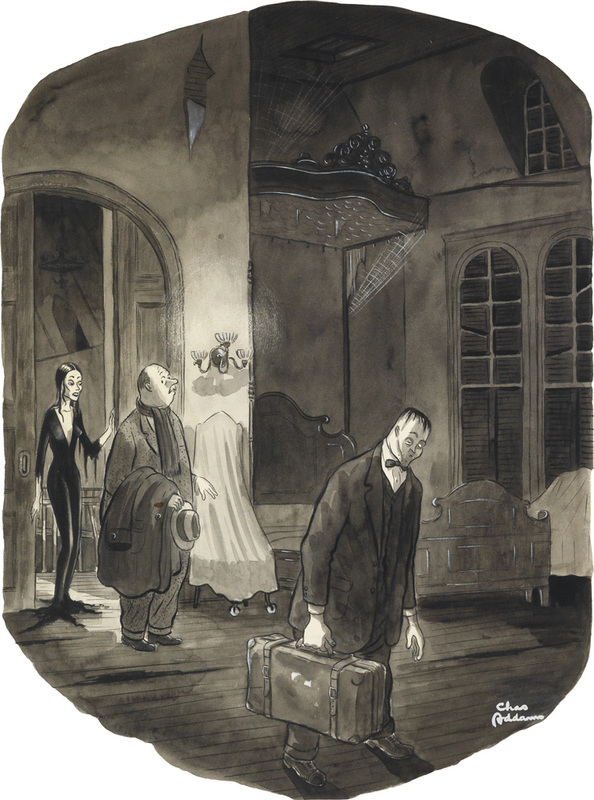 Addams contributed to The New Yorker for more than fifty years, and his work can be found in the permanent collections of The New York Public Library and The Library of Congress. Although his life’s work is estimated to consist of several thousand original pieces, his most well-known characters, those of The Addams Family, only appear in approximately fifty illustrations. Left: "This is you room. If you should need anything, just scream," published in The New Yorker, March 13, 1943. Sold September 29, 2016 for $20,000. 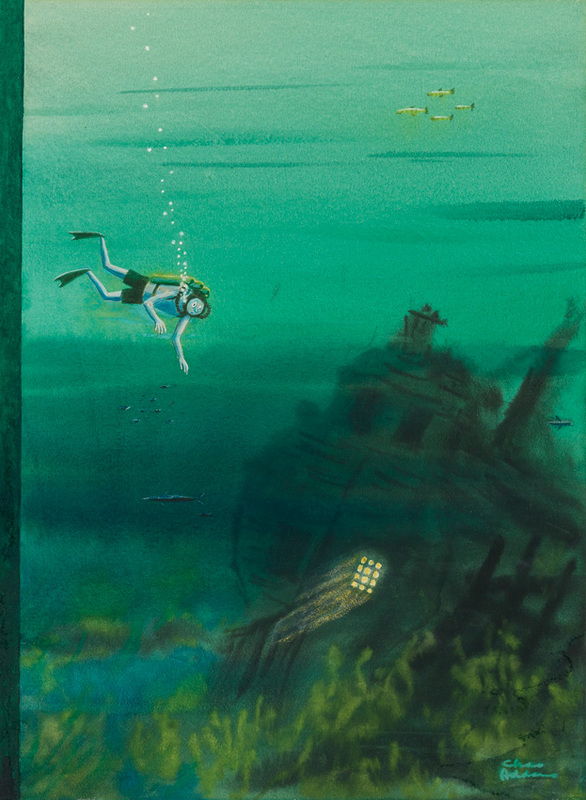 Right: Scuba Galleon, water color and gouache, cover for The New Yorker, September 21, 1957. Sold March 21, 2017 for $16,250. The persistence of The Addams Family is largely due to the vast generations of collectors who saw the family as a refreshing jab at the traditional American family. The cast of kooky characters were born within the pages of The New Yorker in 1938, and brought to life time and time again in the form of television shows, books, a Broadway musical, and feature films. There is an unyielding desire for collectors to adopt an Addams into their own family. Addams Family Barge, image for Mobil Oil, watercolor, pen, ink & correction fluid, 1984. Sold March 21, 2017 for $14,300. 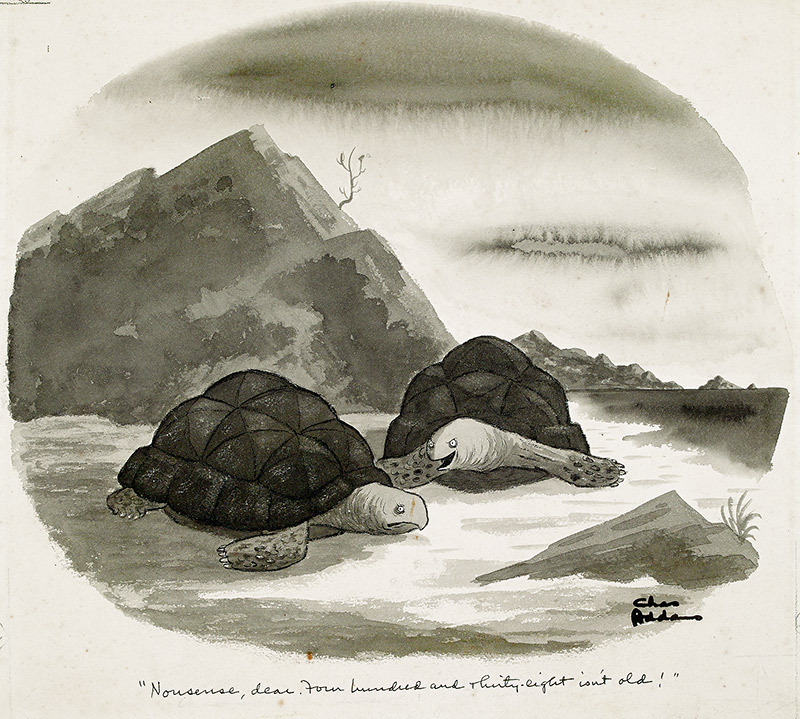 Left: Noisy Neighbor, ink and wash with white heightening, full-page cartoon for The New Yorker, circa 1950. Estimate $12,000 to $15,000. Sold September 29, 2016 for $15,000. Right: Show magazine cover illustration, mixed media, 1960s. Sold January 28, 2016 for $17,500. Addams's life mirrored his art: he married his third wife, Marilyn, in a pet cemetery on Long Island. The bride wore a long black dress. In 1988, he died at age 76 after a heart attack in his parked car, just outside of his apartment building in midtown Manhattan. “He’s always been a car buff, so it was a nice way to go,” Marilyn told the The New York Times–an obituary quote he undoubtedly could have used as cartoon fodder, had he been able. Left: E=MC², watercolor and ink, published in The New Yorker, 1960. Sold January 28, 2016 for $11,700. 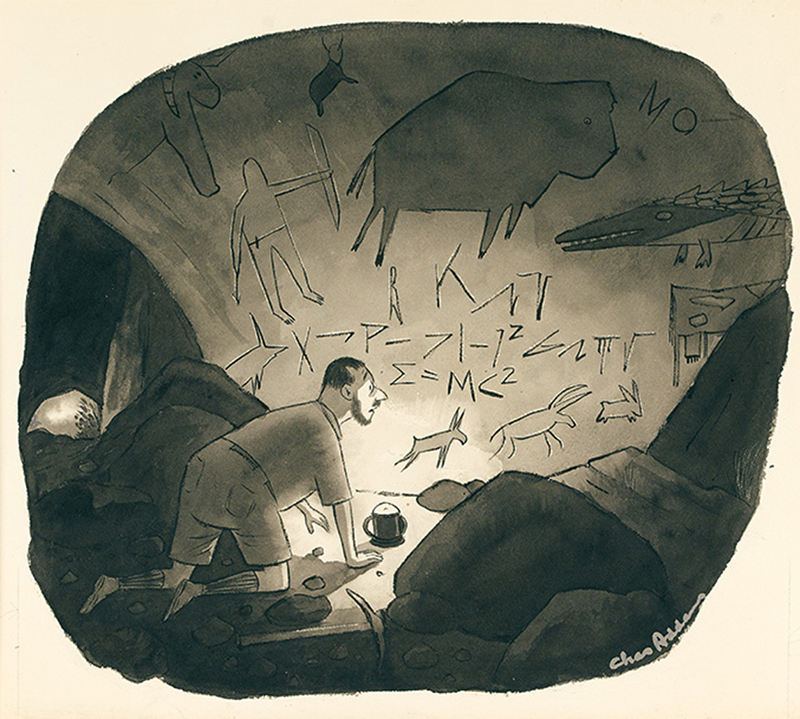 Left: River Styx, mixed media, published in The New Yorker, 1953. Estimate $4,000 to $6,000. Sold September 29, 2016 for $7,250. 1957. Sold September 29, 2016 for $5,000. Upon the Addams Family television debut in 1964, the editor of The New Yorker, William Shawn, refused to publish cartoons featuring the beloved characters. Shawn allegedly saw a conflict between high-brow readership and the low-brow nature of the television show. 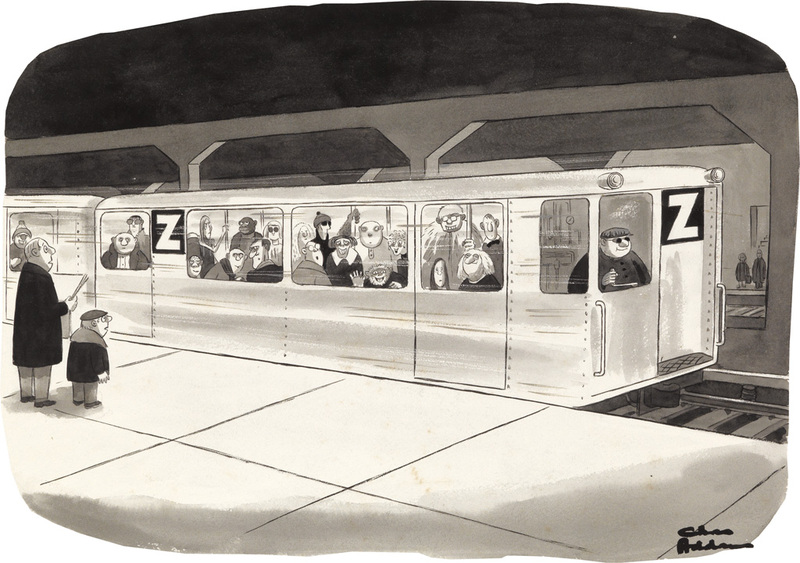 Although the ban lasted until Shawn's retirement in 1987, Addams snuck three characters into the 1979 cartoon pictured below, Z Line Subway. Wednesday and Grandmama stand directly behind the conductor's booth, and Uncle Fester peers out the back window. 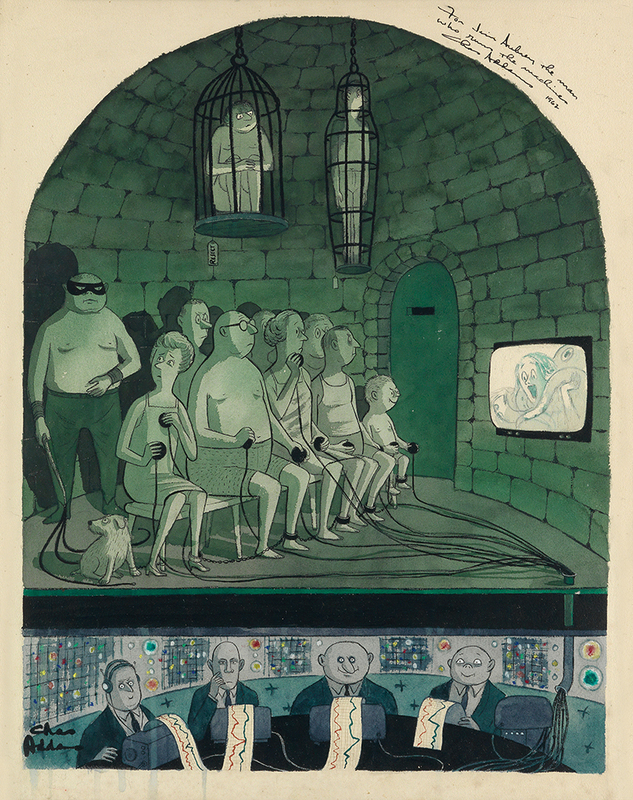 Z Line Subway, watercolor, pen and ink, published in The New Yorker, October 1, 1979. 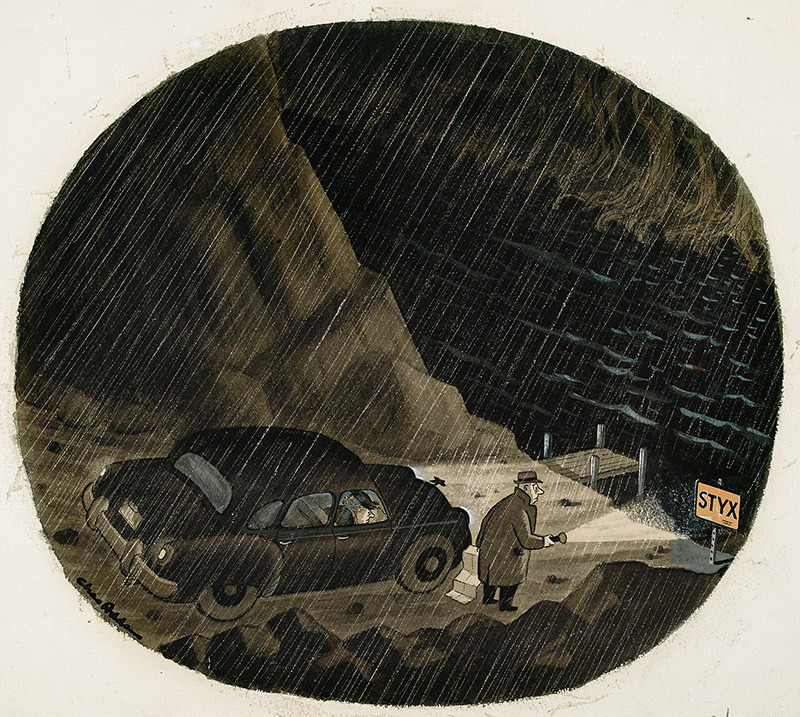 For more information on Charles Addams works at Swann, contact a specialist in our Illustration Art department.